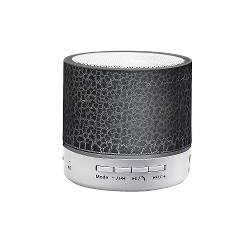 The portable speaker ultron boomer chaka offers multiple possibilities to connect different music sources and scores with cool visual effects. The compact box can play audio content from microSD card, with the provided 3,5mm jack to Mini-USB cable or wireless via Bluetooth. Furthermore, there is a USB port available. The optional LED illumination deliver an optical highlight. The speaker supplies an output power of 3 watt.